Shopify offers multiple plans to manage your eCommerce needs. Here is our breakdown of how to choose the best plan for you. The Shopify Lite plan is only $9 per month, and is the most basic eCommerce option. Shopify Lite does not include a website or hosting, it is purely the back end shopping cart function and a way to manage your products and inventory. If you only need to sell on Facebook/Messenger, or want to add eCommerce to an existing store, you can use Shopify Lite’s buy button and the Facebook App. Shopify Basic is best for new stores making less thank $5k per month in revenue. The Shopify Basic plan is the plan we encourage customers to start with. Shopify Basic will suit most eCommerce businesses for as long as it takes to scale a business to doing over $5k in sales each month. 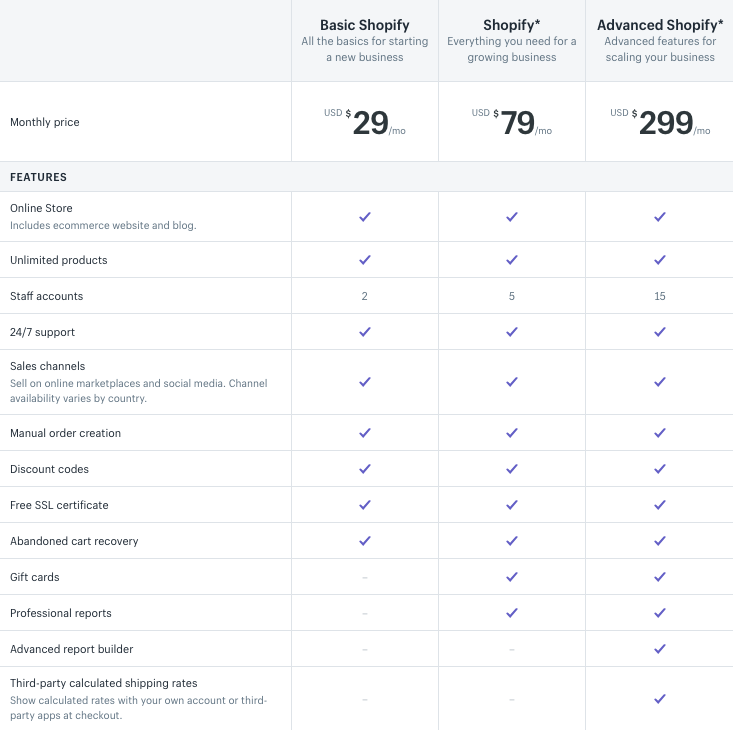 The Shopify Basic plan is $29/month, and each sale (using Shopify payments) has a processing fee of 30 cents and 2.9% of the sale. The more advanced the plan, the greater the shipping discount and capabilities. The next tier of Shopify store is $79/month, with transaction fees of 30 cents and 2.6% per transaction. This plan is ideal for those making over $5k in sales per month, those who want to be able to distribute gift cards, and those needing advanced shipping settings and analytics. If your business has a brick and mortar location, this plan allows unlimited point of sale staff members with unique PIN codes, shift management, and advanced point of sale capabilities. If you are selling in person, an Advanced Shopify plan is best. All Shopify stores come with free SSL security and the capability to securely take payments. Each tier of plan gets a lower and lower payment processing rate. Shopify Plus is an enterprise level plan only available to approved stores. This plan costs $2000 and up per month and is recommended for stores making $1 million in sales per year.